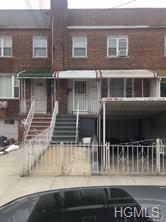 Charming single family home in the Williamsbridge section of the Bronx. Home features three bedrooms with a master bedroom that fits a king size bed.A spacious and sunny formal living and dining area. Huge porch that leads from the kitchen,that over looks the back yard. Ideal for entertaining . Finished basement with it's own entrance from the street level and a exit to the backyard. House is located a few blocks from the # 2 & 5 train. Close to major highways and shopping. Home is in move - in condition.